Perfectly situated in Costa Adeje is the beautiful Baobab Suites Hotel which houses a selection of bars and restaurants that are open to the public. The BB Pool Bar and Brasserie is one of these and one recent evening we were lucky enough to experience for ourselves what everyone else has been talking about. One of the very first things you notice as you walk into the bar is the panoramic view that quite simply takes the breath away. The vista spans from La Gomera and the ocean, along the coast, across the town and high into the mountains – there are quite simply few bars or restaurants that could beat it. It is the perfect backdrop for the clean and crisp lines of the bar and we are suitably impressed as we take our seats. We chose a table that was under cover: though there is also an ample open terrace area, as the evening was a little blustery we found we could have the best of both worlds – the bar is open-sided so we could be nicely sheltered without losing one iota of the view. Even the fact that there was a hint of a chill in the air wasn’t a problem, especially once the wonderful outdoor heaters were lit. Comfortably seated, we turned our attention to the evening menu, filled with mouthwatering choices. Skipping an aperitif we chose Pasta a la Vongole and the enticing Marinated Partridge from a starters list which also includes Iberian Ham Plate, Cream of Velvet Crab, and Pork Cannelloni. As we waited for these to arrive we nibbled on lightly toasted bread accompanied by butter and olive oil and red cheese dressings, as well as a truly delicious almogrote - the traditional spicy goat’s milk (sometimes mixed with sheep’s milk) cheese spread recipe from La Gomera. When our starters arrived we were suitably pleased. The clams in the Vongole sauce were perfectly cooked and the whole was absolutely delicious. The partridge meanwhile was exquisite – served on a bed of escarole with olive oil, honey, peppers, onion, tomatoes and green leaves, with golden yellow caviar and a hint of peppercorns, the blend of tastes was a sensation. We had both chosen water to accompany our meal, though I also enjoyed a glass of a fruity red wine from La Orotava. The wine list is comprehensive and includes reds such as the Jean Leon 3055 and the Adeje bodega’s Tierras de Aponte. Rosés include the Rubicón Seco from Lanzarote and a Clarete de luna, and for whites you can indulge in the fine Zárate or an Ayre, perhaps. Choosing our main courses had been a tricky affair – how does one decide between dishes such as Roasted Turbot with Nut Pesto, Confit of Cod and Pil Pil on a bed of roasted vegetables, or Braised Black Pigs' Cheeks with potato purée, mushrooms and chestnuts. Or even the Grilled Entrecote Steak with fries and padrón peppers? Well, difficult though it was, our choices were excellent: Lamb in Rosemary Honey (it may be a cliché but the lamb really did melt in the mouth) and the Salmon en Papillote - a generous serving of succulent salmon served with wakame (seaweed), mustard and caviar. Both dishes were beautifully arranged on slate platters, and were, quite simply, works of art. 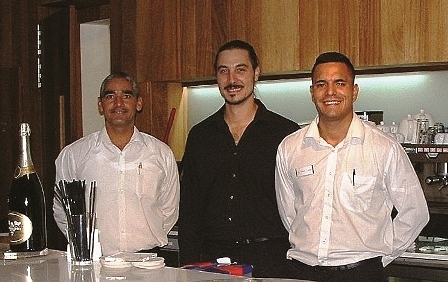 Throughout the evening the service was excellent – attentive but never intrusive, and ever friendly and accommodating. Pau Bermejo is the Executive Chef at BB and we happily sent him our compliments, as everything really was served to perfection. But the evening wasn’t quite over yet. For dessert, the fact that the chocolate fans were in residence became quite evident so, to avoid a protracted discussion (and possible fisticuffs), we decided to share the Chocolate Coulant (crisp on the outside, liquid silk on the inside) that came with olive oil ice cream – an absolute revelation - and a crunchy Chocolate Brownie that was accompanied by the, perhaps, less exotic but equally as tasty vanilla ice cream, along with a rich, warm chocolate sauce. Chocolate heaven! By now, night had fallen and the remote hills were lit with a thousand twinkling lights, whilst off to the right the sea shimmered and La Gomera became a distant silhouette. As we relaxed over our after-dinner coffee we both agreed that it had been a very pleasant evening indeed. Yes, we had somewhat indulged, but it’s just one of those places – the view, the food, the service and the friendly and relaxed atmosphere all combine to create the perfect setting. It’s a special place, there’s no doubt about it: perfect for a celebration, an enjoyable meal or simply enjoying a relaxing drink whilst you take in that incredible view. C/ Roque del Salmor, 5. Costa Adeje. There are also breakfast and lunch menus available. See: www.baobabsuites.com for more information. Produced with news.CMS in 0,0702 seconds.